Fresh, clean and well pressed curtains really bring any room to life and help your home look its very best. Not only that, but did you realise that household curtains can harbour tens of thousands of microscopic dust mites? Your curtains are effective air-filters, trapping airborne dust, odours, hairs, smoke and dead skin particles - the perfect habitat for nasty dust mites. These can cause a wide range of allergic reactions, including eczema, dermatitis, asthma, dry coughs, hay fever and sinusitis – none of which sound pleasant! 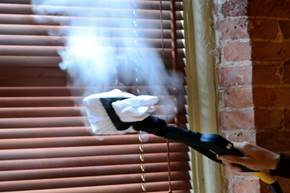 Our Curtain Cleaning Service can help eliminate these problems as well as help to keep your home looking its best. No Shrinkage or Colour Runs Guaranteed! Cleaned on-site – as they hang in place. You will not have to be concerned about taking your curtains down and you will have not have to worry about getting them up again. Curtain Hardwares like rods, finials , rings, tie backs are not included. Step one: Pre-testing your curtains in an unseen area to carefully check that they are safe for cleaning. When the job is completed your curtains will be free of bacteria, viruses, and allergens, leaving them looking and smelling fresh and clean, thus enhancing the appearance of your home. Furthermore, Ultra-Violet light ONLY sanitizes the very top of the curtain surface where the light hits. Dust Mites, Bacteria, Germs, and Viruses live deep down in the body of the curtain to the surface as they sense the body heat of someone lying down. The Steam Vapor molecules are smaller and hotter than regular steam. These Steam vapors penetrate deeper, and clean and sanitize better. This very highly heated steam is 94% dry; leaving little moisture after cleaning. It kills dust mites and all other pathogens instantly. Extremely SAFE to use, and uses NO CHEMICALS. 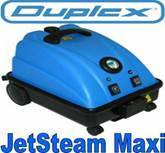 The JetSteam Maxi uses +170ºC to +190ºC superheated 94% dry steam and 8 bar pressure to emulsify soiling, thermally decontaminate and breakdown odours. It can penetrate deep into curtain and kills all contaminates instantly on contact and then is extracted out.